Many skills are needed to play Go. A correct attitude, good concentration, stamina, a mixture of creativity and faithfulness to the principles, all fall in the category of gamesmanship. 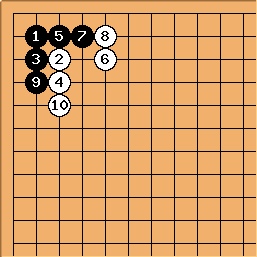 In Go, you particularly need technique, tactics (reading skills) and strategy (positional judgment) in order to start, branch and evaluate a sequence of moves. Knowing where to start, to cut off branches and where to evaluate, depends on technique and strategy. Correctly building up the tree depends on reading skills. When single stones are placed in an empty area, the choice is mostly a strategic one. Therefore, basic technique actually deals with positions where at least one stone of each color is present. The criteria for good or bad technique will be the above principles. Liberties, connection, surrounding are the more basic ones, dealing with stability and development. Equivalence, initiative, efficiency and flexibility are the more advanced ones. The first situation we imagine is one where two stones of opposite colour are adjacent and no other stone is around. The move that reaches this position is called contact play or attachment. 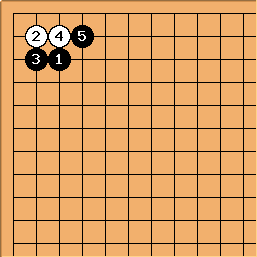 After this move both stones have less liberties than before, so their stability is in danger. Black now has the initiative, so he can take advantage of this urgent situation and decrease White's stability even more. This is why generally, the contact play leads to a disadvantage. In particular, in undisputed area it creates a weak group immediately. 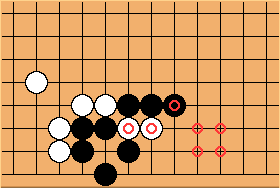 In the opponent's sphere of influence however, where any placed stone is immediately weak, weakening one opponent stone and creating the above urgent situation, can be a good technique. Here we see Black's basic answer to the contact play: wrap around it, either at or at a. The move is also called hane. White's liberties are now reduced to 2 and the stone is in big danger. 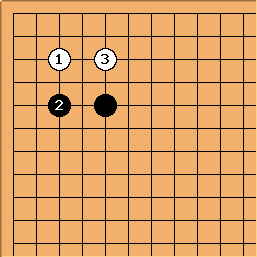 The (small) drawback of this move is the fact that Black's stones are not connected. 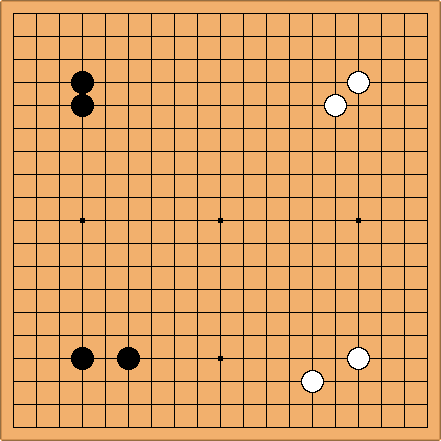 In undisputed area this is not so bad, because if White cuts now, Black has the initiative in a very urgent position (4 weak groups) and there is no friendly stone. If white stones are around however, Black must take more care with this wrapping technique. Black's main alternative for the wrapping move is to stretch. Now he doesn't reduce White's liberties any further, but instead creates a strong connection, giving 5 liberties to two stones. The second situation we imagine is one where two stones of opposite colour are in a diagonal relationship and no other stone is around. The move that reaches this position is called diagonal check. Also called shoulder hit. This move is also very close to the existing stone. In order to evaluate it, we have to look at Black's only answer. The only move against the diagonal check is to stretch (or press) at , because it both reduces liberties for the opponent AND creates a strong connection of two stones. The result is the same as when you stretch from the contact play. The fact that White would be able to reach the same positive result if Black doesn't answer, makes this move an urgent one. White's one-space check does not reduce any Black liberties, nor does it reduce the own liberties. The position is not as urgent as the contact play or the diagonal check. Yet, the white stone blocks off the possible development of the Black stone. 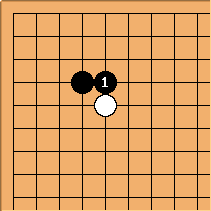 In the abscence of supporting stones, this is considered as a good local move for White, limiting the development of the black stone, while not hurting oneself. In fact, this one-space check is a common attacking move. In the corner it is called one space high approach. If played from above (centre to side), it is called a capping play. The answer a would be a supported contact play. This will urge White to answer, strengthening his stone or weakening a. The answer b does not take away any liberty, nor does it create a strong connection of two stones. Answer c does reduce the liberties and creates a strong connection, but in terms of development it is not as interesting as a "stretch against a diagonal check". Answer d develops nicely to the unblocked side, while e blocks the development of with another one-space check. All these answers are analyzed further down this article. 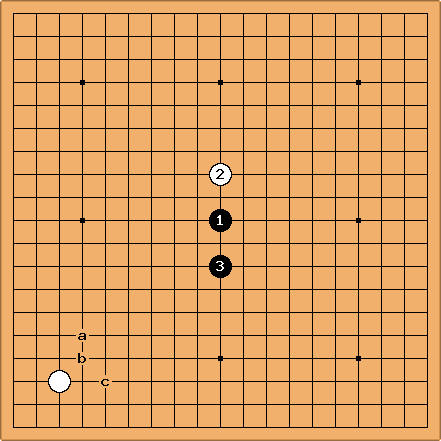 Here, White's move creates an opposition of stones, forming a shape called keima. The position can be called keima check or knight's check. If it occurs in the corner, like here, it is called a small knight approach (of the corner). 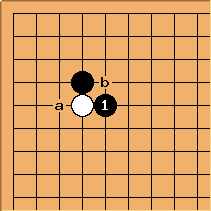 In these situations, where the checked stone is on the fourth line, the main purpose of is to undermine the stability of the stone (see basic strategy), whereas the one-space check blocks the development. 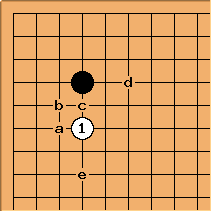 In particular, aims at part of Black's base at a. Although basic technique deals with positions of both colours, we need to label and investigate structures of two stones of the same colour, in order to simplify later discussion. In this diagram, we see the four basic configurations of two stones. We'll discuss them regardless of location. When put onto a specific location, in particular third and/or fourth line, these basic configurations receive more significance (see basic strategy). The upper left shows a simple connection, the upper right a diagonal move, the lower left a one space jump and the lower right a knight's move. A simple connection or stretch has the virtue of being connected. A connected string must be taken off the board as a whole. Here, the total number of liberties is 6. In terms of stability, this strong configuration is advantageous, especially when there are enemy stones nearby. A drawback of the simple connection is a lack of flexibility. When facing opposition, there is no choice but to save or give up all stones together. In the absence of enemy stones, there is more focus on development. In terms of development, this shape is slow: one needs 19 moves to develop accross the board. A diagonal move is not firmly connected. In the presence of enemy stones, it is weaker than a simple connection. As already discussed, diagonal lines are weaker than straight lines when they meet each other. Secondly, the opponent can take advantage of the cutting points of the diagonal, especially when there are several diagonal moves combined. 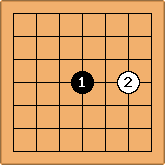 In terms of pure development, this move is as slow as the simple connection: there are 19 moves needed to develop accross the board. Yet, the sense of direction is different: it is possible to connect opposing corners with a diagonal. The one space jump is twice as fast as the simple connection. Only ten moves are needed to cross the board. In terms of stability, this configuration is weaker than the simple connection, when facing enemy stones. On the upside, it has more flexibility. The knight's move has the same speed and even more flexibility than the one space jump. The direction is different: it develops diagonally instead of straight. In terms of stability, it is weaker than a one space jump. The skill of reading is needed to calculate future positions. There are two aspects to tactically analyzing a position: reading depth and reading width. The depth of a tactical analysis is the maximal number of successive moves you have to (or mostly are able to) visualise before reaching a conclusion on what the initial choice is worth. The width is the number of variations into which the analysis can branch. Players with good technique will be able to keep the width of their analysis restricted, because they will not include certain, technically bad, moves in their analysis tree. There is a danger to this: sometimes a play is technically unsound but yet leads to the best result. Players with good positional judgment or theoretical knowledge will be able to restrict the depth of their analysis, because they will reach conclusion much sooner. The theoretical knowledge, enabling one to cut off the analysis soon, is most easily found in the theory of life and death and the theory of capturing races. I refer to these pages for a complete description of these theories. While it is possible to discuss technique regardless of the location of stones or the size of the board, strategy and positional judgment have to deal with these two important factors. 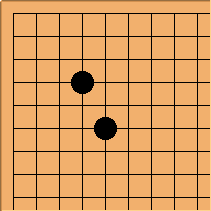 Although Go can be played on any board size, the standard board size for the game is 19x19. This means that potentially 361 points are to be divided between the two players. Due to the fact that, even in the end of the game, stones need liberties to breathe, this full number is never reached. On very small boards, the first two moves almost inevitably have a local relationship to each other, and little else than basic technique will apply in the opening stage. On a 5x5, the obvious first point to take is the central point, because every move by the opponent is bound to either be on the edge, or a diagonal check, or a contact play against to the initial stone. 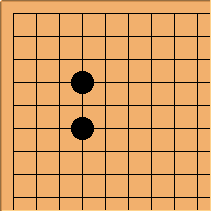 The whole board thus becomes immediately urgent and the player with the initiative cannot lose (he will capture all opponent stones). Incidentally, this board size is solved by at least one computer program. A 7x7 board provides already technically better moves for White's after . Still, a play at the centre keeps the whole board in sufficient range to influence any opponent stone. This board size has not yet been solved by the computer, but still the basic laws of technique govern it and Black can kill almost all white stones. It is an interesting board size for beginners, though, because of its immediate applications of basic technique. A 9x9 board is the first to become really interesting, even for experienced players, because the second move can always be played two lines away from the first move and three lines away from the edge, so that basic technique is only applicable after a few moves and some basic strategy comes into play. This board size is far from being solved by a computer. It is also not possible for Black to kill every white stone. On 9x9 boards and higher, a compensation of a few points is given to white for going second. On 19x19, currently White receives 6,5 points compensation, based on statistical evidence. 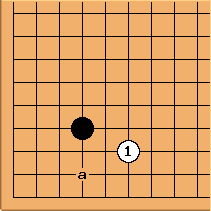 Even board sizes are usually not considered, possibly because mimic strategies by White would take advantage of the compensation (while Black can simply counter these on an odd board size by occupying the central point), or for aesthetic reasons. Why the board size has eventually settled on a 19x19 format is food for speculation. Some voices argue that with the same number of moves, a comparable amount of territory can be surrounded in the centre (delimited by the fourth line) as along the sides (delimited by the third line). Less measurable but probably more accurate, is the statement that on smaller boards there is not such a clear distinction between moves that stabilize and moves that develop. As we will see, moves on the third line stabilize, whereas moves on the fourth line give more scope for development. On a 13x13, moves on the third line already give a fair amount of development, which can only marginally be improved by playing on the fourth line. The prime argument for the location of stones is their stability. How and where can a single stone easily reach life? At the centre of the debates stands the three-three point. This well known comparison shows that a group in the centre, when surrounded, needs minimally 10 stones to create two eyes. A group at the side needs 8 and a group in the corner needs 6. 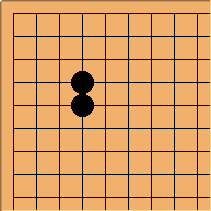 This suggests that a stone in the corner needs less moves to complete a two eyed group. 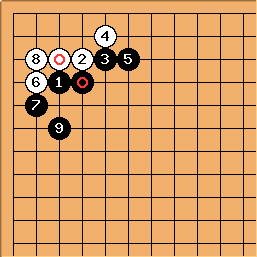 But when looking from White's perspective, we also see that it is not so easy to surround the opponent in the centre (14 stones) as it is in on the side (10 stones) or the corner (6 stones). Being first in the corner provides easier stability. Being first in the corner also applies more control over that area. Both stability and control are not as easy to acquire in sides or centre. Let's focus on three symmetrical corner plays and assess their stability. White cannot kill the 2-2 point immediately. 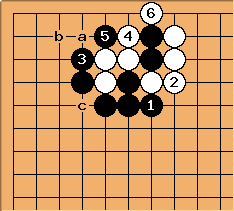 If White immediately attacks the eye-space of the 3-3 stone, she is simply captured as the diagram shows. From the outside, there is no threat to the stability of . So both the 2-2 point and the 3-3 point are impossible to kill without support. With equal initial stability, the 3-3 point offers more scope for development as it is closer to the rest of the board. Now let's look one line higher. Any symmetric point higher on the board does not provide immediate stability. The corner eye-space of the 4-4 point can be swept away immediately by a move at 3-3. Even with the 4-4 stone present, cannot be killed. A stone at the 4-4 point is not stable without friendly stones. 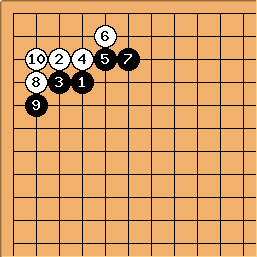 If we try to apply the ideas of small boards to the 19x19, we must examine the value of a first move at 10-10. Clearly, this move is the worst choice in terms of immediate stability, but on the other hand it can be argued that this stone has equal influence in all directions on the rest of the board. If White blocks one direction, the stone can still develop to all other directions. Compare this to a 3-3 stone, whose development can be blocked or limited immediately by any move reasonably close to it. Let's now examine the 5-5 point. White immediately takes away the corner eye-space, without hurting itself. Black cannot apply any technically sound move to confine White to the corner: it will develop to the side, be it limited. If we look at the 4-4 point and the result of White's base-removing move at 3-3, we see that Black can apply basic techniques to completely confine White to the corner. Black builds a powerful position with a lot of influence to sides and centre. In fact, Black's group has almost become alive and can be called very stable. If the 4-4 point is approached from the outside, as in this diagram, it develops on a larger scale than the 3-3 point. One can visualise and quantify this if one thinks of the area behind the lines as potential territory but care has to be taken with labeling the area as definite territory. This proverb is often rendered as "the fourth line is the line of influence, the third line is the line of territory". While it may be true that the area behind a safe group on the third line is territory, due to its being the eyespace of the group, this rendition leads astray from the main virtue of the third line, which is stability. The typical asymmetric point in the corner is the 3-4 point. This move is obviously chosen if one desires more immediate stability than with the 4-4 point and more potential development than with the 3-3 point. The drawback of asymmetric moves is that they are biased to one side. The opponent can take their bias into account. These moves are less flexible in that sense, but that is not experienced as a major drawback. Before discussing more technique and strategy, we have to introduce some new concepts. Sometimes, for strategic reasons, we deliberately have a stone, or a few stones, captured by the opponent. Such a maneuver is called sacrifice. The difference with an ordinary capture lies in the intention. Of course, sacrificing a group so large that you lose the game, is a bad strategy. Anyway, the concept of sacrifice is implemented by a few techniques, but has a definite strategic flavour. In the light of sacrifice, there are two kinds of groups: light groups and heavy groups. A light group is a group that you are happy to sacrifice. The loss doesn't amount to many stones, and the sequence leading to capture will have considerable positive side effects. The group does not fulfill functions that cannot be taken over by other stones. A heavy group is a group that you are unwilling to sacrifice but have difficulty securing. A heavy group cannot be strong, by definition, and is mostly a large one, or it fulfills functions that cannot be taken over by other stones. The sequence leading to its security has considerable negative side effects. When one or more stones are killed in a local fight but they are not captured yet, moves in the neighbourhood or even far away, can threaten to bring these stones back to life. This property of killed stones is called their lingering potential. More in general lingering potential is the set of all possibilities remaining in a position, when a local fight has come to rest. There is no urgent move left, but the position is not completely void of defects either. The threat to connect or save lost stones, to cut or to kill safe stones, cannot be carried out immediately, but remains as a possibility that can be exploited at the appropriate moment. A typical example of lingering potential are stones caught in a ladder. Any move along the lines of the ladder can break it, hence save the stones and severely affect the overall position. Leaving the lingering potential allows for some degree of flexibility. There is a strong notion of timing to the concept. There is no way that White can save her marked stones immediately. The moment a white stone is placed at one of the circled points, however, the potential of those stones comes to life and the lower black stones are threatened with capture. 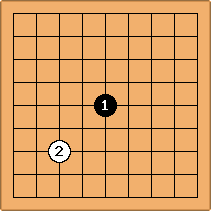 removes the options in the position for both players (settles the shape), because either the availability of options is considered favourable for the opponent, or there were no options left for the player forcing the sequence so that he chose to settle the shape into the most favourable result possible. Forcing moves mostly remove any lingering potential that might have been available. There is a strong notion of timing to the concept. 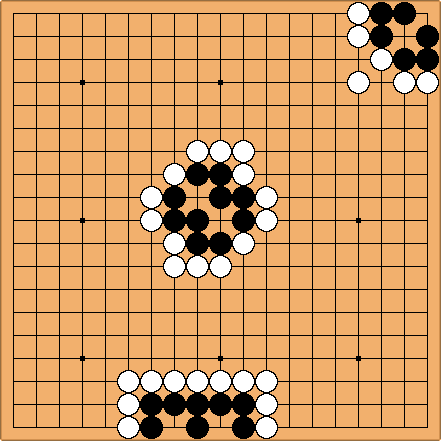 After a sequence of forcing moves, the functionality of the opponent's stones has not essentially changed, while the forcing stones keep some future purpose. In this position, Black has a few forcing moves. He starts off with . If unanswered, White's position would completely crumble. 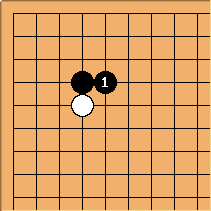 then forces White to take the two stones. White may decide (but is unlikely) to abandon her three stones, depending on the rest of the top side. Next, forces once more to effectively take the stones off the board. Next, Black can play along the left side or connect around c.